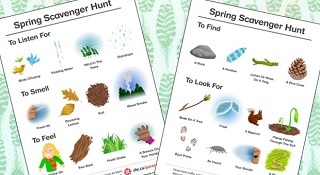 Here is a spring/summer scavenger hunt using all the senses to explore the great outdoors. This is a wonderful way to soak up the days getting a little longer, the air getting a little warmer and the great thaw promising new life. If you want to reuse the scavenger hunt, again and again, you can slide the scavenger hunt into plastic page protectors or you can laminate it. Use a dry erase marker to mark items as you find them.